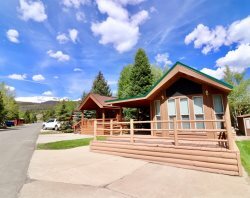 Rent Executive Chalet 87 at Tiger Run Resort in Breckenridge, CO.
Our Executive Chalets provide that extra quiet luxury you are looking for. This is a large unit with a Colorado Room which provides for extra living space during your stay. Specifically this unit offers extra sleeping space as it has a Murphy Bed located in the Colorado Room. Each chalet has one bedroom, kitchen, bath, living room and many do have a non-sleeping loft for kids play or storage. Some chalets do have gas BBQ grills and each chalet has a deck with outdoor seating. Generally, the chalets can sleep four (4) adults comfortably. Each chalet is stocked with kitchen utensils and linens. Check-in is at 4:00 p.m. Smoking and pets are prohibited in the chalets. Our resort is simply gorgeous! We know you appreciate a well-kept park, and ours is the nicest you'll ever find. We go out of our way to offer a clean and attractive environment, with the comfort and convenience of home, all in a very natural setting. As you stroll around the grounds, you'll love the little things that make our resort an exceptional place to vacation. Experience real Rocky Mountain Magic! Our resort is in the heart of Colorado's best outdoor activity area, and we offer four seasons of fun for everyone. Hike or bike your way through incredible natural forests over 60 miles of paved pathways, from Breckenridge all the way to Vail! Skiing of all types is available at your choice of four nearby ski areas, and the two rivers adjacent to the resort bring the wilds of nature right to your cabin door.